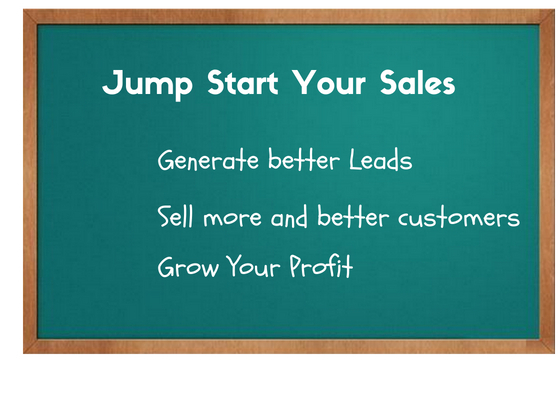 Sales Jump Start program Our process is detailed and proprietary. It combines the elements of consulting, coaching, and partnership relationships into a 90-day program built to provide you with a sales growth process and program. Your company will be selling new and better customers with a program that is yours and sustainable over the life of your company. Consulting These services are generally short-term. We do an analysis of your area of concern and make written recommendations for change. Very good for sales, marketing, hiring, training, and specific operational issues. Coaching Short to mid-term. We consult and participate in the implementation of new programs and training with accountability benchmarks assigned to the client or their managers. More broad-based than consulting, coaching will generally lead into more than one area of the operation. As an example, a good marketing program will still under-perform without a solid sales program. So coaching in both areas would be needed. Partnering This is a long-term program where we become part of your senior management team and give resources (research and labor) to achieve the growth over a longer period of time. In this relationship, we can become your outsourced business development company which includes: producing and implementing marketing, lead generation, sales materials, sales training, finance functions, hiring, and management classes. Our 20 years of experience and hundreds of millions of dollars of new sales we’ve generated have allowed us to test and refine the My One Call business growth system. Our process contains elements that no other consulting or coaching company utilizes, as they are internally developed. Our methods are detailed and proprietary. What we can publish is a summary of what our process includes. We incorporate all or selected parts of the following plan with a new client who seeks business growth. In this system, growth begins with information and is followed by a process. The vast majority of a successful marketing and sales strategy is accomplished in the identification and reach to new prospects. Many businesses focus on the presentation of services, which is only one small part in the sales. Clearly and accurately identify demographics of your ideal prospects. Through our unique process which includes research and business intelligence gathering, we assist you in identifying prospects that bring you the highest returns. Clearly identify what these prospects want in your service, and why they buy your service. Clearly identify where these prospects find your service. Through research and business intelligence, we will sort out the best areas to promote your service. Define your company’s message based on the above. Develop marketing collateral’s, sales tactics, and training. Develop a growth plan that can be measured by each responsible department. Acquire business intelligence on prospects. Train you and your team in contacting, presenting and selling new accounts. The amount of sales training needed. Status of current marketing materials. The experience level of sales division in prospecting. By going through the process, you will save a significant amount of money in wasted advertising and marketing to the wrong demographics. Your company will have a clear defined prospect database that will give you a high return on your marketing and sales dollars. You will have a clear message to new prospects based on what they want, not on what you want to tell them. You will have a defined sales process and a tracking system. In this relationship, My One Call becomes your company’s “outsourced” marketing, and business growth firm. As such we will provide the services described in the Jump Start Program as well as assist or complete many of the prospecting tasks. It’s like have a Vice President of Marketing, Sales Training and Business Development all in one. Over time, we will develop new marketing pieces, new presentation books, and a website as needed to grow your business. We manage all the advertising and research and implement new opportunities. As growth brings new challenges, we also can conduct management training as needed. You’ll have your own highly skilled and experienced partner – without the partnership problems. If what you pay us or another firm to do works – gets results – the cost of marketing is zero. Free. If the marketing doesn’t work, it’s just like flushing that money. We custom quote all of our programs. But here are some ranges to give you an idea. Sales Jump Start program $6,500.